Pope Francis talks with Myanmar State Counselor Aung San Suu Kyi during a private audience at the Vatican (May 4, 2017). The restoration of diplomatic ties comes with Pope Francis’ offer to help with peacebuilding in Myanmar. On May 4, Myanmar and the Vatican announced the establishment of formal diplomatic relations following a meeting between State Counselor Aung San Suu Kyi and Pope Francis. This moment holds significance not only for Myanmar’s estimated 700,000 Catholics (who constitute a little over 1 percent of the population), but also for interethnic peacebuilding in Myanmar. Rapprochement with Myanmar reflects the Vatican’s renewed engagement with Asia under Pope Francis, following his 2014 visit to South Korea, 2015 visits to Sri Lanka and the Philippines, a 2016 meeting with Vietnam’s President Tran Dai Quang at the Vatican, anticipated visits to India and Bangladesh later this year, and ongoing negotiations with China to resolve a decades-long rift over the authority to appoint local bishops. The next step will be for Myanmar to appoint an ambassador to the Vatican and for the Pope to appoint an ambassador (known as an “Apostolic Nuncio”) to Myanmar. Until now, the Vatican has conducted diplomacy through the Apostolic Delegate to Myanmar, Bangkok-based Archbishop Paul Tschang In-Nam, who also serves as Apostolic Delegate to Laos and Apostolic Nuncio to Thailand and Cambodia. Unlike Nuncios, Apostolic Delegates are papal representatives to the local Church but have no official relationship with the government. Formal diplomatic relations will afford Myanmar deeper interaction with the Vatican and the global Catholic community, as well as potentially improved relations with Myanmar’s Christians, many of whom are ethnic minorities. Of Myanmar’s 16 Catholic dioceses, 15 primarily serve ethnic minorities, including in Kachin and northern Shan States, where the government and ethnic armed groups are negotiating an agreement to end decades of civil war. Yet, closer relations with the Vatican likely mean that Myanmar will hear more from the Pope about the plight of the Rohingya, a Muslim ethnic group in Rakhine State whose members have been declared by the government to be illegal migrants. Anti-Rohingya violence, partly fueled by strident ethnonationalist rhetoric from elements of the Buddhist population, has prompted an international outcry. Suu Kyi’s refusal to acknowledge systematic persecution of the Rohingya or to support a UN fact-finding mission to Rakhine State has also elicited disappointment and criticism. 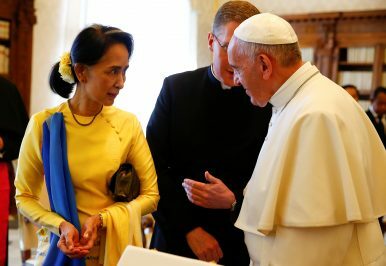 During their meeting, Pope Francis presented Suu Kyi with his message for the World Day of Peace on January 1, titled “Nonviolence: a Style of Politics for Peace.” The message, which links nonviolent peacebuilding to Jesus’s commandment to love one’s enemies, is also an advertisement for the Church’s peacebuilding capabilities. In it, Pope Francis pledges the Church’s help “in every effort to build peace through active and creative nonviolence” and announces that the new Dicastery for Promoting Integral Human Development — an administrative department of the Vatican — was now commencing its work. The Dicastery merges several administrative bodies tasked with promoting and implementing Catholic social teachings (including those regarding migrants) and aims to build relationships with external organizations that promote justice and peace. The Pope’s message to Aung San Suu Kyi seems clear: the Church stands ready to assist Myanmar in nonviolent peacebuilding. On April 26-27, Cardinal Bo organized a major interfaith peace conference in Yangon, drawing some 200 Buddhist, Christian, Muslim, and Hindu leaders as well as government and civil society representatives. Participants discussed how religions could cultivate grassroots peacebuilding activities. Such activities, conducted with the moral authority of religious leaders, could help defuse violent ethnonationalist rhetoric and sustain momentum for a peace agreement between the government and ethnic armed groups. Here, the Church’s plans to request the government to return dozens of Catholic schools nationalized by the Ne Win regime in 1965 could play an important role. Such schools, which serve both Catholics and non-Catholics, could help reduce poverty through education and inculcate values of diversity and intercultural respect, particularly in ethnic minority areas. Although the Vatican is a small state and Catholics in Myanmar relatively few, closer relations between the two countries could forge new pathways toward interethnic peace. Jonathan T. Chow is Assistant Professor in the Department of Government and Public Administration, Faculty of Social Sciences at the University of Macau.